Nato chief Anders Fogh Rasmussen has called on Pakistan to combat militants who use the country as a launch-pad for attacks on neighbouring Afghanistan. He was speaking alongside Afghan President Hamid Karzai on the eve of US-led talks aimed at soothing tensions between Afghanistan and Pakistan. Nato is set to end its decade-long combat mission in Afghanistan before the end of next year. 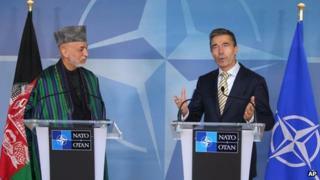 Mr Karzai said he was looking forward to Nato's continued support. Speaking at Nato's Brussels headquarters, Mr Rasmussen said: "We need a positive engagement of Pakistan if we are to ensure long-term peace and stability not only in Afghanistan, but in the region. "Pakistan and Afghanistan have a mutual interest in fighting extremism and terrorism and cross-border activities." A secret Nato report on Islamabad's links to the Afghan Taliban leaked in February says the Taliban are helped by Pakistani security services. Pakistan has denied the claim, saying it has no hidden agenda in Afghanistan. Mr Rasmussen said the Nato-led International Security Assistance Force was in the process of handing security operations to Afghan forces; Isaf's role was gradually shifting "from combat to support", he added. John Kerry may be hosting talks between Afghanistan and Pakistan but there is no sign that either is ready to make concessions. Previously Turkey and Britain failed to secure a deal. Tensions have been raised by arguments between Afghan and Pakistani border troops at remote border posts. The Afghan delegation is led by President Karzai, but Pakistan, now in the middle of an election campaign, is represented by the head of the armed forces, General Kayani. Pakistan says it is committed to playing a constructive role. It wants Afghanistan to cut its strong alliance with India, and send officers to train in Pakistan. But ahead of the talks, the Afghan presidential spokesman Aimal Faizi rejected these demands. Afghanistan wants Pakistan to use its influence over the Taliban to bring them to the negotiating table, and stop militants crossing the border. The 100,000 remaining Isaf soldiers are due to be withdrawn by the end of 2014, after which Nato says its role in the country will essentially be a training one. Mr Karzai said Afghanistan would "definitely be able to provide for the security of the Afghan people". The Afghan leader was later scheduled to meet US Secretary of State John Kerry, who was also holding talks with the head of Pakistan's military, Ashfaq Kayani. On Wednesday the three men will hold a joint meeting - alongside Afghan Defence Minister Bismillah Khan Mohammadi and Pakistani Foreign Secretary Jalil Jilani - as part of what the US describes as "an ongoing trilateral dialogue". Mr Kerry hopes Wednesday's talks will help to bolster security in Afghanistan and along its rugged 2,600 km (1,600 mile) border with Pakistan. He has described 2013 as a "critical" transition year for Afghanistan, 12 years after the US-led invasion to topple the Taliban regime that was harbouring al-Qaeda leader Osama bin Laden. The leaked Nato report - based on the interrogations of 27,000 captured Taliban, al-Qaeda and foreign fighters as well as civilians - says Pakistan is aware Taliban leaders take refuge within its borders. Senior Taliban figures such as Nasiruddin Haqqani are housed close to ISI headquarters in Islamabad, adds the report, entitled State of the Taliban. For its part, Pakistan says Afghanistan gives safe haven to militants on its side of the border.